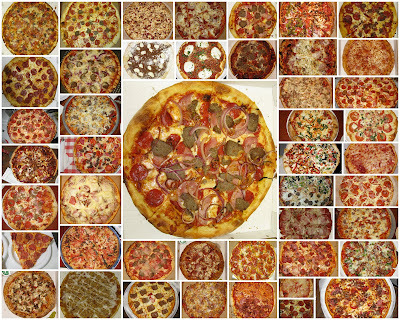 The above collage shows 46 of the pizza's that I enjoyed so far this year, I still have one more day, who knows I may get one more in before the year is up. 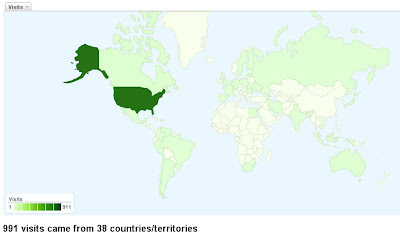 Costco Food Court Pizza with 108 page views. The video speaks for it's self. I visited Frank and Helen's about 4 months ago as part of The Pizza Files 2009 Summer Binge and did a full review at that time, so I will keep it short. I got the call Sunday morning that the family was going to Frank and Helen's that evening to have Broasted Chicken, and did I want to go? Of course I wanted to go, but I wasn't going to have chicken. Out of the 11 family members only 3 of us didn't get chicken (it must be good to pass on pizza). On This visit as before I started with the Casa (house salad) with the House Creamy Garlic dressing, and as before it was quite good. I did have them add some mozzarella cheese to the salad this time. For Pizza I ordered a Medium Extra Thin crust (St. Louis Style) with the Signature Red sauce, mozzarella cheese, pepperoni, Canadian bacon, meat balls and red onions. Just like my last visit the pizza was excellent. The ingredients were all fresh and tasted very good. The quantity of each ingredient was just right. Although the St. Louis style crust is not my favorite it did a good job of conveying the pizza from plate to mouth and added a crispness to the package. On my June visit I noticed that they served Crown Candy Ice Cream after I had already eaten to much and had no room for dessert, this time I saved just a little space to share a scoop. My wife and I had a scoop of coffee ice cream. It was well worth saving the space. Some day I will make the trip to Crown Candy Kitchen and have a malt, but that will be another story. So if you are craving some great pizza, Broasted chicken and ice cream you can't beat Frank and Helen's. Frank and Helen's is located at 8111 Olive Street Rd in University City, MO. You can reach them at (314) 997-0666 or check out their web-site by clicking the title link. I know, I was just at Racanelli's Cucina in June(click to see), but the opportunity presented it's self. How could I say no to pizza? On this visit I had a Peppercorn Ranch Salad, which includes mixed greens, tomatoes, bacon, red onion, parmesan and grilled Foccacia. I believe they forgot the Foccacia, but I had more than I could eat anyway. The salad is a meal in it's self. 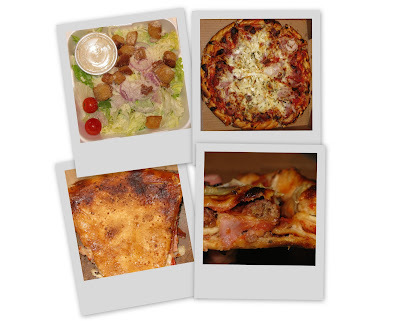 If you want something smaller you will have to share it or get a House salad, the only one to come in a small size. When served there is the offer of fresh ground pepper, but it has plenty of pepper already. The Peppercorn Ranch salad was a great way to start the meal, and I wouldn't hesitate to order it on future visits. 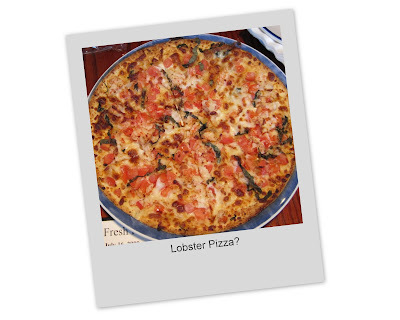 On my previous visit I had the Margherita pizza. It had been so good that I was tempted to get it again, but then I wouldn't have had any thing new to write about except the salad and this isn't the Saladfiles.com. So this time I ordered the Action Jackson (say that 3 times really fast...). It has pepperoni, sausage, red onions and mozzarella cheese. As with all the pizza's here it only comes in a 12 inch thin hand tossed crust. I have to say up front, I'm not a big fan of Sausage on my pizza's and only order it on rare occasions (Why, you ask? Well my experience with sausage has run the gamut from quasi meat pellets to so many herbs & spices that you can taste nothing else). The sausage on the Action Jackson was pleasantly flavorful with out overpowering the rest of the pizza. It was a very good combination and I would gladly order it again, as long as it was the second or third pie. I didn't get around to trying the "Johnny's Famous Pound cake Sandwich" on this visit, so It looks like I will be returning in the future. That's more or less how Blackthorn Pub became part 16 of the Pizza Files 2009 Summer Binge. Today's pizza was a Chicago style deep dish with pepperoni, hamburger and onions. Where's the salad you ask? The Blackthorn has pizza, pizza or pizza, if you want something other than pizza you are in the wrong place. To call the Blackthorn a dive bar is an under statement, but it does have pretty good pizza. You just got to know how to get served, luckily The Man lives close by and knows the rules. I go into more detail about the Blackthorn in the furture, so check back soon. 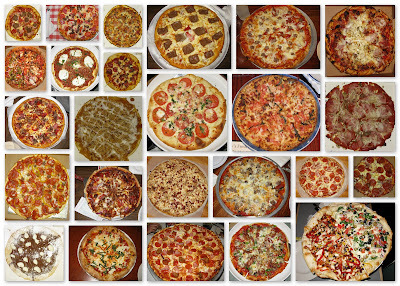 Don't you just love The Pizza Files 2009 Summer Binge? It has truly taken on a life of it's own. Pizza comes to me now. 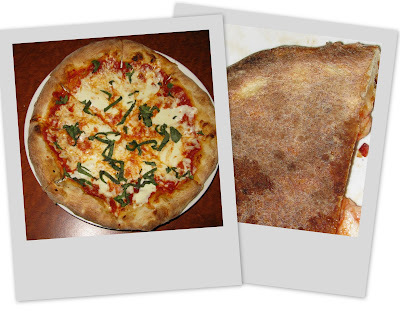 That's how Nick & Elena's Pizzeria became part 14 of the Pizza Files 2009 Summer Binge. The Binge is fast coming to a close, August 9th will be the last day. After working on a project all day, I found myself hungry, without food and no energy left to cook. Plus I just didn't want to waste a weekend by not having pizza, but it had to be fairly close and some place I hadn't been to. 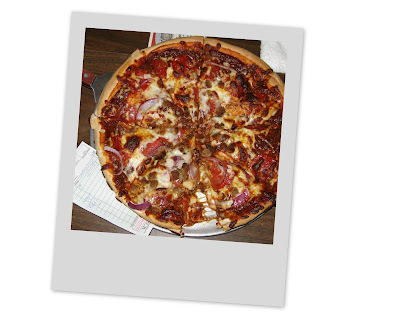 That's how JJ Twigs became Part 12 of the Pizza Files 2009 Summer Binge. 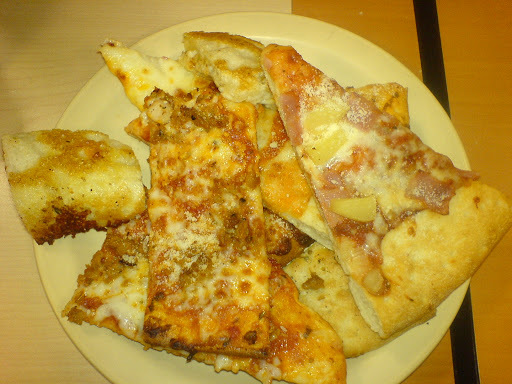 The Pizza Files 2009 Summer Binge Part 10! I'm two over budget. 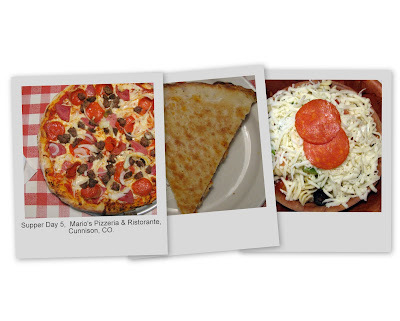 In Gunnison, CO today, the motel staff gave me 2 recommendations that were in walking distance, one a "cowboy bistro" and the second was Mario's Pizzeria & Ristorante. I actually went to the cowboy bistro (I'm in cowboy country after all), but they were closed. That's how I came to part 10. I started with a Mario's famous 1/2 & 1/2 salad (half iceberg lettuce and half rotini pasta mixed with black olives, tomatoes and bell peppers and topped with mozzarella cheese and pepperroni), and for the main course I ordered a 11" pizza with pepperoni, Canadian Bacon, meatballs and onions. You can follow my Road Trip progress at the links to the right. I'm on the great Road Trip 2009 and recently found myself quite hungry and in Chama, NM. Just a 5 minute walk down the street was Feliciano's Home Run Pizza. That's how I came to Part 9 of The Pizza Files 2009 Summer Binge. 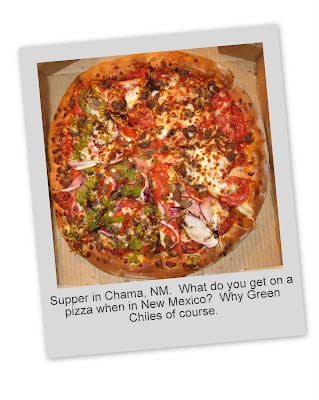 Being in New Mexico There is only one topping you must get, and that is Green Chile's. Feliciano's was a memorable part of my Road Trip, and speaking of Road Trip's check out my other sites to check on my travels and see a few of my photos. A co-worker has been telling me about Erio's Ristorante for some time, but they are only open for supper. Recently both of us were working the late shift and decided it was time to order from Erio's. 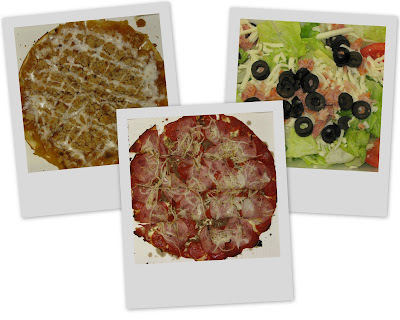 Erio's Ristorante is family owned and opened for business in 1970 in Florissant, MO. They moved to St Peters in 1991. Their menu has all items you would expect at an Italian restaurant, appetizers, salads, pizza, steaks & veal, chicken & fish, pasta, sandwiches and desserts. Their hand tossed pizza's come in 12" and 14", for an extra charge you can get a thicker New York style crust. For cheese, you can choose between fresh mozzarella and provel cheese. We started with a Erio's House Salad, it had Mixed fresh greens with artichokes, Italian Volpi salami, provel cheese, red onions, peppercinis, Sicilian green olives and Erio's House dressing (Italian vinaigrette). The salad was very good, but the salami was just a bit more than I needed. I would get the dinner salad next time, it's the same minus the salami. For pizza we ordered a standard hand tossed large with pepperoni, hamburger, onion and yellow peppers. The crust was was similar to New York style, but of uniform thickness all the way across. The bottom had a fair bit of char (pizza lingo for the black bits on the bottom) but didn't taste burnt. The crust would droop a some when it was still hot, but was quite chewy. the pepperonis were sliced thin the way I like them, and the small nuggets of hamburger were lightly seasoned. Both the onions and yellow peppers fresh. Oh yeah there was sauce in there also. The combination worked well. I have to say that I was awestruck by the crust, it was exceptional! Over all the food was great, the crust warrants a return trip alone. 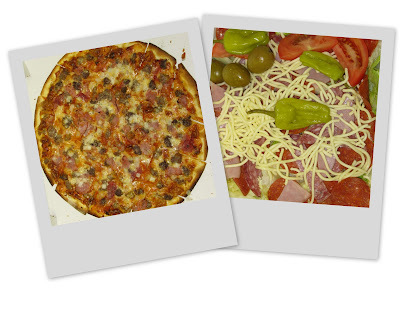 The Sicilian salad and the Pizza di Palermo are both on my list for the return visit. The downside of Erio's is that they are only open for dinner (4p.m. - 9p.m. later on weekends) and they don't deliver the delicious pizza. So if you find your self in St Peters after 4 p.m. you can't go wrong with Erio's. 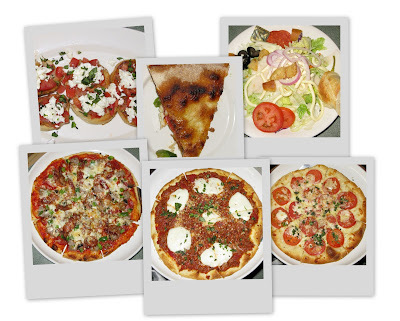 Erio's Ristorante is located at 951 Jungermann Rd. in St. Peters, MO. You can reach them at (636) 928-0112, for more information check out their web-site(click on the title link). The "Man" calls the "Dude" and asks the Dude if he wants to get some pizza? The Dude is all like "yeah man, cool". The next thing you know the Man and the Dude are at Dewey's. I Reviewed Dewey's back in November 2008 so I will only talk about what the man and the dude had to eat. The Man went Greek and ordered a Greek salad and the Socrates' Revenge pizza (Olive oil, minced garlic, mozzarella-fontina blend, spinach, black olives, green olives, feta cheese, red onions and tomatoes). The Dude ordered a Peppercorn Ranch salad and the Southwest BBQ Chicken pizza (olive oil, smoked cheddar, mozzarella, black bean corn salsa, Amish chicken, roasted red peppers and BBQ sauce). I shall refrain fro the Dude and The Man for now. I had been eating a lot of pizza around the time of this review and I've eaten at Dewey's a number of times, so when I ordered I went out of my box some. The Socrates' Revenge was very good, I especially liked the olive oil instead of regular sauce. As much as I liked it I would probably max out with one or two slices. A small dose of olives go a l0ng way for me and the Socrates' Revenge is all about the olives. The Southwest BBQ Chicken pizza was also very good, not something I would routinely order, but very good for a change. As with my previous visit to Dewey's the food was excellent. The pizza's both out side my norm were great and I would even order them again under similar circumstances. There are a couple of things about Dewey's though; 1. You will probably have to wait for a table when you go (20 minutes this visit for a table for 2 & 30+ on a previous visit with more people), guess if the pizza wasn't very good you wouldn't have to wait. Time, It's the price you pay for good pizza. 2. We had about 4 or 5 different people ask if we were ready to order. They do "Group Serve", were anybody can take your order and all tips are shared. I think we were taking a long time to decide and that's why we saw so many faces asking for our order. They were all quite friendly and attentive to our needs. 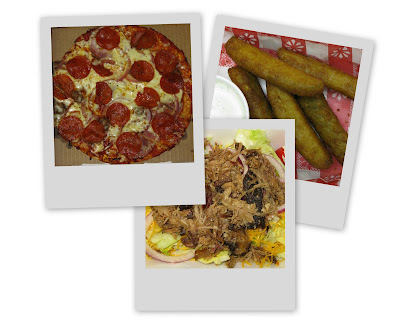 Dewey's Pizza is located at 124 N. Kirkwood Rd. Kirkwood, MO. You can reach them at (314) 821-7474, for more information check out their web-site(click on the title link). The Pizza Files 2009 Summer Binge has reached it's original goal of eight pizza joints, in a mere 4 weeks. My original plan was for 8 different pizza joints over a 10 week period, so I can only imagine what my final total will be. My good friend and fellow pizza eater from last Thursdays Binge suggested that We sample one of the fine Pizzeria's on the Delmar Loop. Thursdays are good for both of us, That's Racanelli's Cucina Part 8.